Elektra and Epic will be bred in the summer of 2019. This litter will be whelped in Savannah. We are accepting deposits for this litter. Peri will be bred to Red in early summer of 2019. This litter will only produce blue merle and black tri puppies, and will be whelped in Savannah. We are accepting deposits for this litter. Dynasty Miniature American Shepherds is proud to be an AKC Breeder of Merit. Dynasty Minis is very proud to have several dogs in the top 20 for FAST CAT. At the top of the rankings is our very own girl, Quest, who is a Rosie and Kane puppy! Dynasty Minis is very proud of Quest and her owners. As of December 3rd, Dynasty's Vision Quest RA FDC CAX FCAT RATO DN CGCA TKP 28.02 MPH. We are very proud of all the hard work all the owners have done to get these new titles! 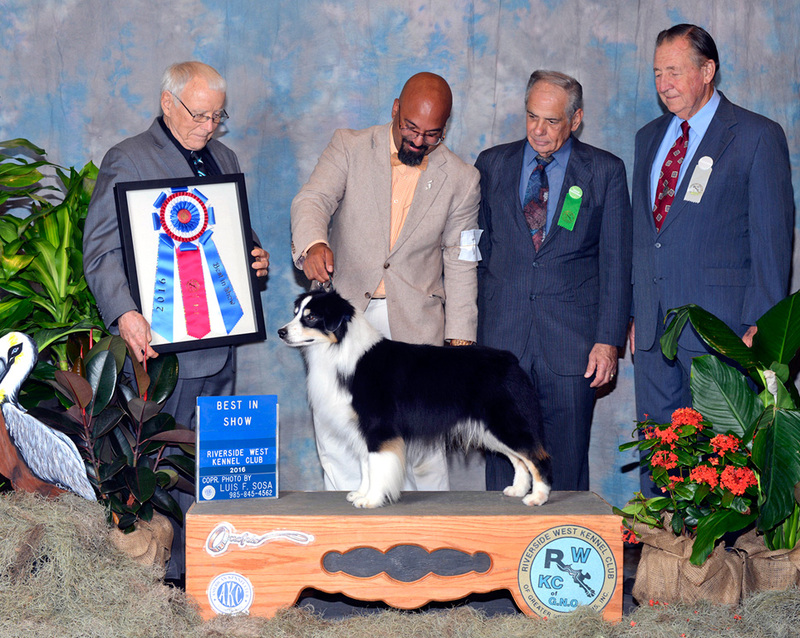 Remi became the only BIS male Miniature American Shepherd in AKC breed history in 2016! He also became the only Multiple Group Winning Male for the Breed for 2016. It is an honor to have our very first Best in Show. Many thanks to Judge Mr. Bill Edwards and to the Group Judge Mr. Michael Canalizo for such a prestigious win. 6/3/2016, Riverside West Kennel Club of Greater New Orleans, Inc., Biloxi, MS.
Dynasty Minis' success comes from teamwork. Fran and Kim both plan for and whelp the litters. Fran is the one who spends the first few months with the show prospects before they move South to start their career. Fran also presents several of the dogs in the ring and has several owner handler group placements. Kim gets the dogs at about 5 months old and gets them into condition to show and used to being on the road. Our handler, Arvind DeBraganca, and his wife Joyce spend hours training, grooming and presenting our dogs. They are an integral part of our team. 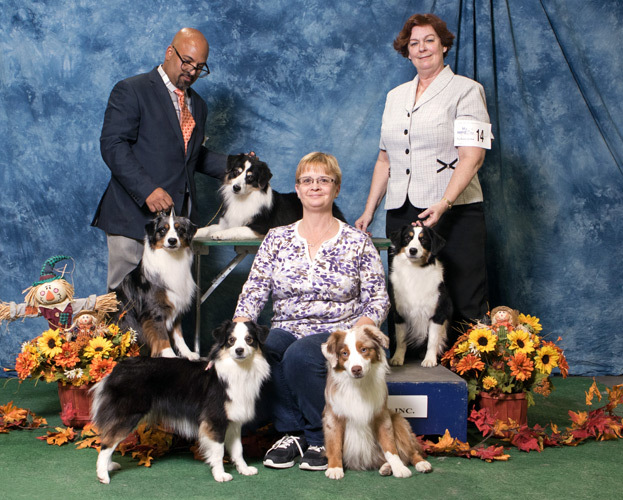 Photo: Fran Withers with Ember, Arvind DeBraganca with Remi and Deacon, Kim Johnson with Blaze and Kenya in Ohio in November 2016. At Dynasty Miniature American Shepherds, we pride ourselves on quality. We are very selective in our breeding program and with that we produce a small number of litters each year. Our owners become part of our extended family and we enjoy keeping up-to-date on pups' progress. We invite you to take a look at our dogs and welcome any questions regarding our breeding program. The vast majority of our dogs are registered as Miniature American Shepherds, but we do still have some Miniature Australian Shepherds in our program. The Miniature American Shepherd moved to the Herding Group in July 2015. We have some amazing Co-Owners and Dynasty Dog Owners that are out there having a great time with the Dynasty Dogs they own. To see what the dogs have been up to, please visit our News page. If you are an owner and would like to share your information on what you and your dog are doing, please email us and remember that we love to have testimonials too! For videos about how your puppy was raised, how to train them when they come home, how to show a dog in AKC, traveling with your dog, home remedies, and more, visit Fran Withers' YouTube Channel.